Whether you live by the beach, are holidaying somewhere tropical or are simply looking to stay cool during Summer; a womens beach kaftan belongs in every ladies wardrobe. With their relaxed fit, lightweight fabrics and vibrant prints, womens kaftans are the perfect summer companion. At Esteem’s Boutique womens beach kaftans are our best selling style over the summer months. Our range is constantly changing due to the high demand but there is always plenty to pick from. When selecting our ladies kaftans and womens tunics we always look for natural, lightweight fabrics. Rayon and cotton beach kaftans are generally the most popular as they are breathable, natural non-synthetic fabrics that are easy to wash and wear. Embellished chiffon kaftans are also very popular at the moment and very on trend this summer. Our womens beach kaftans range in length from above the knee to full length with a few different silhouettes, some loose and free flowing and others with a little more shape – so there is something for everyone. The Esteems Boutique online store has a great range of ladies tunics and kaftans. 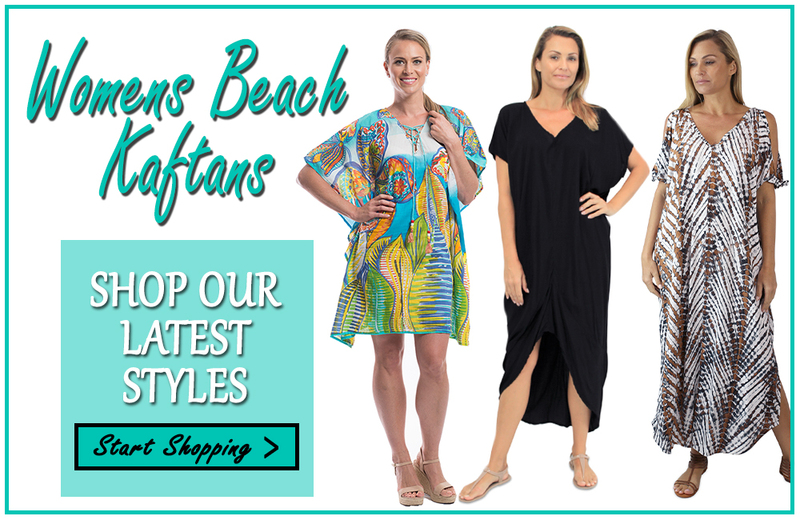 Throw them over swimmers, style them with a capri pant or wear them after your shower on a hot summer evening – no matter how you style it, the ever versatile womens beach kaftan is an Australian essential. Shop online today, postage is only $4.95 Australia wide and our hassle free returns policy ensures you can shop with confidence. Esteem’s Boutique is an Australian online clothing store offering fashionable, flattering and affordable women’s clothing and accessories. Stocking sizes 10 – 22 and featuring a large range of natural fabrics, you’re sure to discover outfit inspiration to suit your own personal style.